Discover the best of Varanasi and Khajuraho on a private 5-day tour from Delhi. Visit Varanasi, the most sacred city in India, and see where Hindus practice their spiritual rituals before heading to Khajuraho to view the impressive temples with intricate carvings. This 5-day itinerary offers insight into India’s religious culture, great sightseeing with a local guide and plenty of time for your own exploration. This golden journey starts from Delhi, offering the visitors a chance to animate the remembrance and colourfulness of the Mughal and Rajput era. Once this tour starts, visitors will find themselves amazed with the fascinating art and sculptures in Khajuraho, beauty of the holy Ganges in Varanasi and a lot more. Addition of fun, adventure and thrill will bring liveliness to this tour. Each day of this package boasts of its unique way to make the tourists familiar with the local life and its culture. The beauty, aura and grandeur of the places covered in this tour will definitely make this tour an unforgettable experience, which can cherished for an entire lifetime. On arrival at Delhi by air you will be met by our local representative who will assist you to board a vehicle to our Hotel, afternoon we depart for local sightseeing of Delhi covering Rajpath, the capital’s broadest avenue, for a view of Parliament House, the President’s House, India Gate. Visit the Humayun’s Tomb, Qutab Minar and Birla Temple. Eveining return to Hotel. Overnight stay at New Delhi. After breakfast we check out of our hotel and drive to Jaipur OR take an optional train to Jaipur where on arrival you will check into our hotel. Evening at leisure. Overnight stay at Jaipur. After breakfast we depart for local sightseeing of Jaipur covering Amber fort, City Palace, Jantar Mantar, Hawa Mahal, Birla Mandir and Jai Singh’s Observatory. Overnight stay at Jaipur. Drive to Agra, stopping en-route to visit the abandoned city of Fatehpur Sikri. 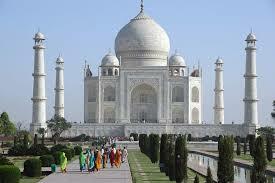 Arrive check in Hotel evening we visit the Agra Fort and Taj Mahal (A monument to the memory of love). Return to Hotel. Overnight stay at Agra. This morning experience the train ride to Jhansi, leaving by the ( 2002 Bhopal Shatadbi Express) at 08.10 hrs and arriving at Jhansi at 10.40 hrs. Continue by road to Khajuraho en route visiting Orchha, a mediaeval city frozen in time. A medeival city frozen in time and space. Existing to this day. Arrive Khajuraho. Check in Hotel. Overnight stay at Khajuraho. After breakfast we check out from our Hotel at Khajuraho and visit the Western & Eastern group of Temples then transfer by air to Varanasi. 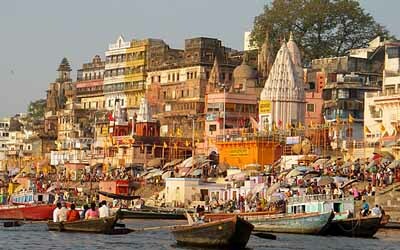 Take a flight to Varanasi. On arrival at Varanasi . You will be met by our representative who will assist you to board a vehicle to our Hotel. Late afternoon we visit the stupas, ruins and museum at Sarnath. The scene of Buddha’s first Sermon. Evening return to Hotel. Overnight stay at Varanasi.